This camera, manufactured by Sugaya Optical Company of Japan, is an automatic exposure, leaf shutter, fixed lens viewfinder camera taking 13 x 17 mm exposures on size 110 film cartridges. It dates to ca 1978. 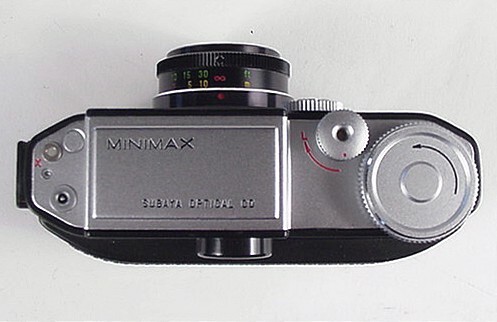 Although its appearance is that of a larger 35mm camera, it is quite petite, measuring approximately 2 inches tall by 3 3/4 inches wide by 2 inches deep. It's a cute little picture-taking machine. The non-interchangeable lens has a focal length of 32mm and maximum aperture of f 2.0. Focus is adjustable down to 1 meter. However, the camera does not have a rangefinder. Neither aperture nor shutter speed are manually adjustable, but are determined by the electronic exposure system. The viewfinder is bright and clear, with projected frame lines for the standard lens. A front mounted dial allows setting of film speeds between ASA 64 and 400. The shutter is synchronized for electronic flash. The Minimax does not have a mechanical frame counter. The clear plastic window in the camera back is used to view the 110 film cartridge frame numbers. This is the modern version of the red window. Notice a red curved line on the camera top, with the letter L at its tip. This fancy feature is the shutter release lock - to prevent unintentional exposures. The lens focusing ring is engraved in meters and feet. I really like the large and comfortable wind knob and shutter release button. This is how I bought this camera - with lens cap and case, in unused condition. Unfortunately I did not receive an instruction book, or other papers that might give additional information on the camera's origins. 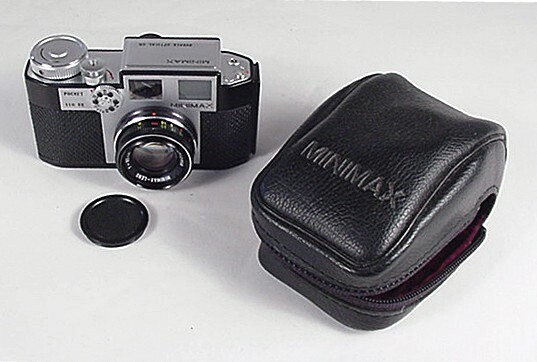 I was told by the seller, who brought this camera from Japan, that the Minimax Pocket 110 EE was not imported to the United States. 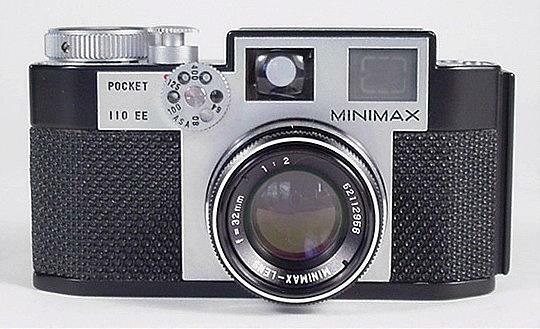 Recently I received an email from Mr. Hiromu Morine of Japan with an explanation of the origins of the Minimax Pocket 110 EE camera. I am grateful to Mr. Morine for sharing his knowledge and taking the time to solve one of my mysteries. Mr. Morine, a native Japanese speaker provided this information in English, which is excellent, and a big help because I cannot read Japanese. There is very little information written in English about the Minimax 110. I know of only two sources. One source is the Sub Club Web site. See the links page for a link to the Sub Club. The other source is the book Spy Camera by Michael Pritchard and Douglas St. Denny, published by Classic Collection Publications, 1993. Below is the information I received from Mr. Morine. Sugaya Optical Co. was established by a former Nikon engineer Mr. Sugaya. He alone made about 200 Minimax all together. 150 was exported to europe, especially to Belgium. The rest of them were sold within Japan�through a local camera shop. The retail price was $250 30years ago. Back then it was the same price as the low-end SLR, so it was a luxury mini camera. It was exported by Tokyo Material Co. 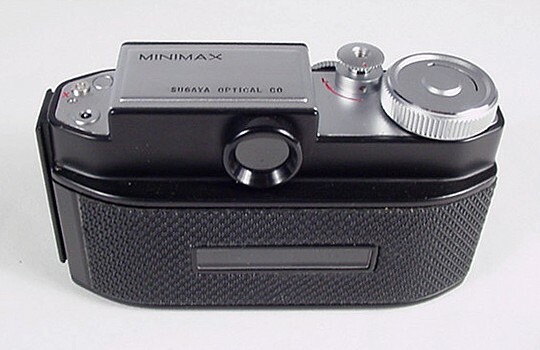 There was a new model coming out after the Minimax, even the prototype was made, but this development cost too much, so Sugaya sold the prototype, and the blueprint to Pentax, and shut down his lab. Pentax then just put the well known name Pentax auto110, and marketed it. It is known that the prototype was exactly the same as the marketed Pentax! So actually he should be credited for creating the world's smallest SLR.. The Body is a diecast metal. This camera is an auto exposure camera, and the speed and the aperture (assumed to be�F8-F11)�was controlled by turning the ASA set-up dial. Without battery, the speed is locked at 1/125. This camera is extremely rare, and historically important piece .So please take very good care of it, and try taking picture with it. You'll be surprised with the sharpness of the lens.